Back of card: Tiny black & white reproductions of six of the cards, among them the 2 of Swords & the 7 of Wands, both shown above. The six are inverted & repeated on the bottom half of the cards, so this deck may be inverted. Booklet included: No. There is a folded sheet with 7 panes/14 pages. Measurments (folded): 2.65 x 4.7 inches, or 68 x 120 mm. Comments: Hieronymus Bosch was a Flemish painter of French ancestry. He lived from 1450 to 1516. He was a contemporary of Leonardo da Vinci (1452-1519). During his lifetime he was famous throughout Europe. Philip II of Spain collected his works. By the mid-16th century his work was both widely copied & often forged but thereafter he fell into obscurity. He was rediscovered towards the end of the 19th century. Some thirty paintings & about as many drawings survive, which is not much. Bosch painted a world of strange creatures doing weird things in eerie landscapes. Some of his paintings show both cruelty & eroticism, subjects rarely shown by other artists of the period. He is considered a forerunner of surrealism, some five centuries later. 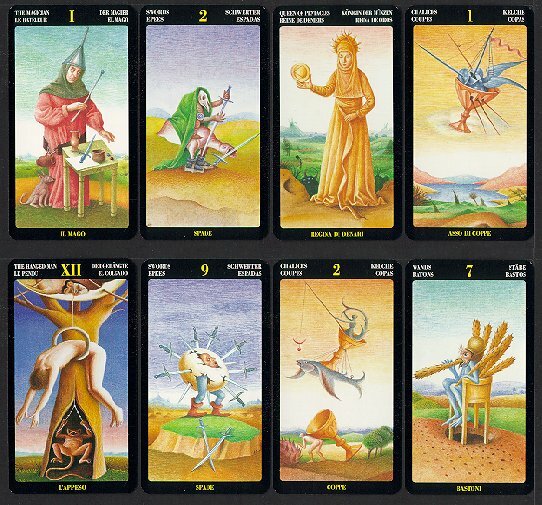 His work makes for a most interesting tarot deck. The artist who created the deck, A. Atanassov, has restored some of the earliest medieval decks & has a good grasp of medieval style. The brief notes are by Riccardo Minetti, the head of Lo Scarabeo. Regrettably, his notes do not mention Hieronymus Bosch. I hope you enjoy this deck.